When it comes to crime, it’s no longer a bad area problem. Record gun sales and home alarm sales all point to the fact that Americans are taking dramatic steps to protect their homes and their family. While a lot of focus has been placed on what to do after the intruders entered your home, today we’re going to talk about what you can do to keep them out. In the past, there was no easy way and definitely no economical way to physically stop someone from coming into a home. You want to keep intruders out from ever coming in. A couple of things that people really need to understand is that an alarm system tells you that someone has already broken into your house. About ninety percent of the time, if someone’s gonna break into your house, they’re going to come in through a door. 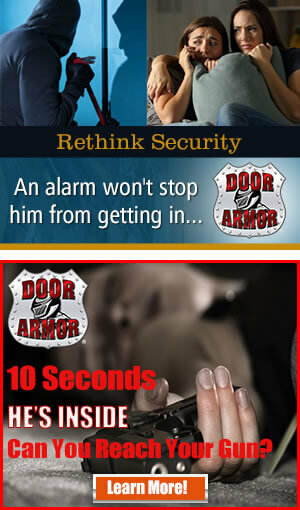 So what ArmorConcepts has done is basically develop a couple of really easy ways to stop people from kicking in a door. So if you have a deadbolt on your door, they kick the door in and this whole area just busts out. 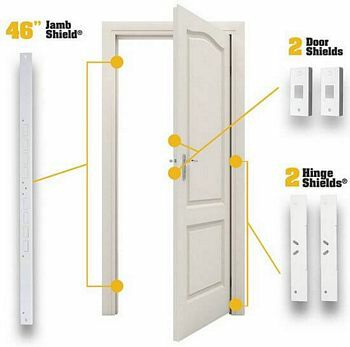 A great product called Door Armor is available and you put it on the frame and it prevents the door from breaking. The next part that’s really important (and comes in this kit) helps reinforce the lock area on the door. So the jam, the lock area on the door and then it also comes with hinge protectors, because a smart burglar will just take a step over and kick the door off the hinges if he doesn’t get in that way. So basically all the weak points on the door are reinforced so there’s nothing else to break. 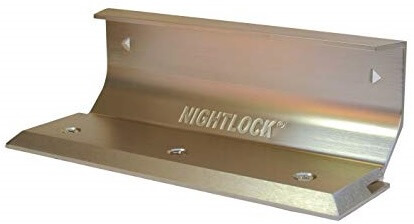 Another good inexpensive solution if you’re going to be in the house is a product called the Night Lock. This screws into your floor, slides in and prevents someone from physically pushing the door in. One of the most important things that you need to have in your house is a deadbolt because a doorknob is not going to provide you any kind of security. So instead of going and having to drill another hole, a U-lock allows you to basically turn your doorknob into a deadbolt and you still have something that will allow you to open and close the door. The important thing is to make sure that your deadbolt is locked. I’m not against having a double sided deadbolt, especially if your door has a window near it, because that prevents someone from breaking the window and reaching around and unlocking the door. But just make sure that you do lock the deadbolt. That’s very important. What are some other misconceptions that homeowners usually have when it comes to securing their homes? Probably the biggest one is the difference between security and letting you know that someone is in your home. The second one is the good-bad area problem. Over last several years in particular, there’s been a dramatic rise in crime in the better areas. So people that are in certain areas are used to dealing with it and people that are in certain areas aren’t and what we found is that many things have really increased the occurrence of crime in both rural and better areas. Click here to buy the best product for reinforcing front door!